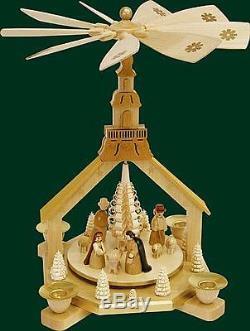 Natural German Church Nativity Christmas Pyramid Handcrafted in Germany Carousel. This beautiful pyramid was handcrafted in Seiffen, Germany by Richard Glaesser GmbH. The detailed pyramid features the Nativity scene. This new pyramid is approximately 10.6 inches tall. Note: Candles are not included with pyramid. This pyramid uses the 14mm size candles. Imported by Pinnacle Peak Trading Company. DecorationWarehouse and Home and Holiday Shops appreciates your business! The item "Natural German Church Nativity Christmas Pyramid Handcrafted in Germany Carousel" is in sale since Tuesday, April 04, 2017. This item is in the category "Collectibles\Holiday & Seasonal\Christmas\ Current (1991-Now)\Other Current Christmas Décor". The seller is "decorationwarehouse" and is located in Tempe, AZ.